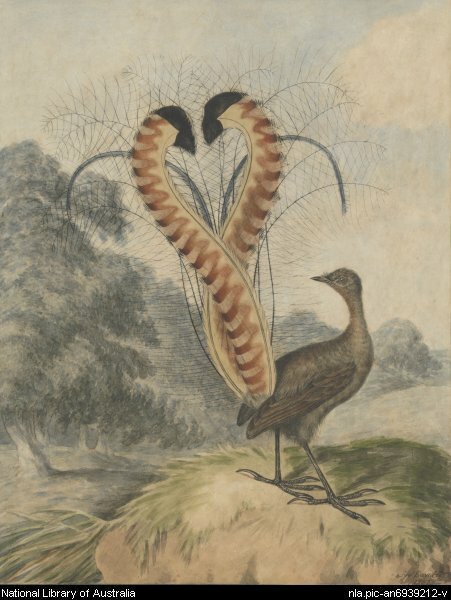 Lyrebird by Edwards, Sydenham, 1769?-1819. Stooping over, I walk under tree-ferns with bison-like beards which arch over pathways. Their beards are rough and filamentary, but tight and trimmed. Fronds umbrella up and out, framing the grey sky like lacy curtains. Way above me, the canopies of Mountain Ash engage in deep conversation with the wind. Scars on these trees show where limbs have been lost. I feel meek and vulnerable walking under these giants on such a windy day. It is not just the trees that I have come to be with on this day; another has called me (back) into the cool temperate rainforest. The singers are hidden amongst the long, fallen ribbons of bark, they are somewhere down in the gullies beckoning me forth. I cross over deep muddy puddles, past flowing creeks and decomposing fallen trees. Everything in the forest is saturated with water and deep iridescent green. Pulled deeper in as the sun hangs low in the winter sky, I know there is not long before I must retreat to places of light and warmth. Up a rise and the earth dries out. The track twists to somewhere unknown and I sense to halt. A dark grey rock nearby summons me. I sit atop this cool, smooth form and close my eyes. A singer repeats his calls across the track from me and another somewhere behind. Like a creator of all other beings, from its song emerges the Yellow-tailed Black Cockatoo, Eastern Whipbird, Laughing Kookaburra, Eastern Rosella and its own songs. From oneness comes many. This bird holds songs and dances, it is an invoker and a weaver of creation. When I stand from the rock, something has deepened. It is time to descend from this hill and retrace my steps below the swaying canopy. But an invitation to encounter holds me a few moments longer… a male lyrebird jumps onto a tree branch, his brilliant tail festooned below him. Hypnotized by sound, he repeats again and again the songs of the other forest beings and I wish for a feather. Why do I want for this material form? Is the song not enough to make me feel this reality? Turning to walk back I am stopped by something small, fluffy and grey on the track. So unimaginably wispy, it is almost not there. I delicately pick up this grey flank feather and hold it between two fingers. The wind quickly finds it and I watch it dance and swirl before me. Each feathery filament animated and stating its aliveness. Yes, I love those lacy doilies, my mum and bubi used to crochet them. Seeing a lyrebird, even if for a fleeting moment, is a thrill. They are such elusive beings.